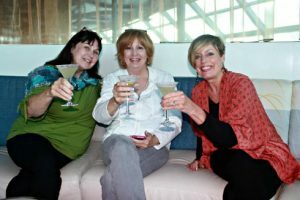 Alaska – My 50th State – Celebrity Cruising Style! Written by Mary Corcoran. Posted in North America. Alaska has always eluded me. I’ve visited all of the other 49 states, and when Celebrity offered an attractive deal for a September Alaska cruise, I jumped at the chance. In fact, my daughter Aimee (also a travel consultant here at Bay World Travel), 2 friends, and 5 family members decided to witness this milestone with me. What a phenomenal trip! 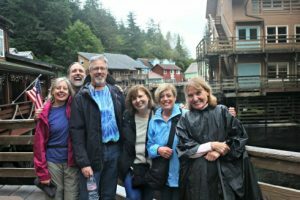 The company of people I love, the incredible scenery, the “edutainment” style of learning about the natural wonders and history of Alaska through the Celebrity Life program, and the onboard experience combined to make this the trip of a lifetime. Not only was this my first trip to Alaska, it was my first “big ship” cruise experience. I was concerned that the embarkation, meals, disembarkation, and ports would be mob scenes. 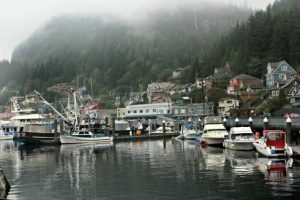 I was pleasantly surprised that every aspect of this cruise felt as open as the state of Alaska – yet the cruise ship was fully booked. It’s hard to capture the essence of this trip just because the ship and the state are so big! But I’ll try! We went through an area of this fjord where ships and boats and people all need to be quiet so as not to disturb the natural beauty. Imagine being on a ship with 4,000 people when it’s perfectly still. And we got all the way to the Sawyer Glacier, so close we could hear the ice cracking, see harbor seals resting, and witness the glacier “calving” truck size blocks of ice into the cold deep water. 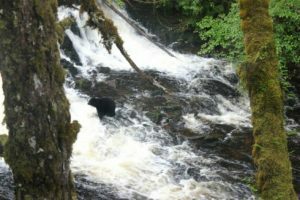 On a nature hike outside Ketchikan, I saw a black bear fishing for salmon in a rushing waterfall (he missed 3 and finally got a big one) and found a hidden waterfall outside Skagway. My sister-in-law Karen got a good photo of the 2 year old. I was enjoying a massage when a frolicking humpback whale was spied just off the port side of the ship, but my brother got a couple of great photos. 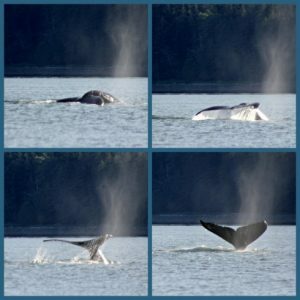 And Karen was able to capture this great shot of a humpback on a whale watching boat near Juneau. This experience felt so indulgent yet Celebrity cruise fares are not over the top – no wonder this cruise line has won Cruise Critic’s “Best Value for the Money” award. Our group fell in love with the dining room staff, and dinner at the main dining room became our nightly ritual. Sanyo our head server, Allan our sommelier and Cerna who served as host and took care of our vegans’ and vegetarians’ more complicated dinner selections, made us feel like we were being welcomed into their homes. Since we had done a nominal upgrade to the premium drink package (totally worth it – thank you, Ruell at the pool bar for suggesting it! ), we were entitled to free-flowing wines, cocktails, specialty coffees, and after dinner drinks. By day 2, Allan knew our preferences and took care of pairing our food choices with great wine. In addition to the daily shows – magic, music, dancing, and a Cirque style performance – we were blown away by the Celebrity Life programs. We never got to the Top Chef events (which looked like a lot of fun) because we were drawn to learning more about local wildlife and Alaska history. We focused on the presentations by naturalist Brent Nixon and his wife Mary Amanda Fairchild. Brent can do a mean impression – and I mean mean! – of a sea lion, but his orca, humpback and harbor seal impressions weren’t too bad either. Ms. Fairchild is an Alaska history expert and was thoroughly entertaining in her lady of the night role as “Miss Amanda.” These ladies figured prominently into the gold rush days of southeast Alaska. But the most surprising and interesting presentation was her “Titanic: The Last Song.” This sounds odd to offer on a large cruise ship but it was riveting and emotional. It turns out “Miss Amanda” is also a member of the Titanic Society and a forensic musicologist. Yes, the last song was “Nearer my God to Thee” but a little known version written by Arthur Sullivan. Cruises are perfect for a group – enabling people to choose their own activities but come together to share stories and enjoy a meal or drink together. 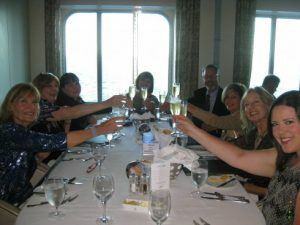 Our ritual was to have an evening cocktail – sometimes on the stateroom veranda (we had 4 adjacent staterooms). Our cabin attendant Gaston – also a great guy – was able to open the partitions so we could sit down together. We had all our dinners together and found a special area of the Ocean View buffet where we would look for each other at breakfast or lunch if we were not out and about. Something and somewhere for everyone. Some of us wanted to enjoy the Canyon Ranch spa and some of us preferred to explore the ship. Shore excursions ranged from high adrenalin activities (Aimee, Lucy, Kyle, and Paul elected to snorkel in Alaska!) to nature hikes. And some of us elected to explore on our own. While we didn’t have kids on board, my young adult daughter did want to enjoy some of the nightlife (we all indulged in an evening of karaoke but then left her to her own devices). There are lots of programs for kids and teens as well. 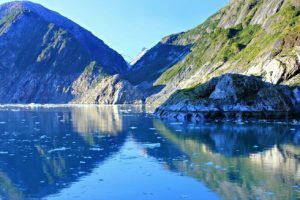 If you haven’t considered a cruise because of the concerns of crowded commercial ports, rest assured you won’t feel that way in Alaska. 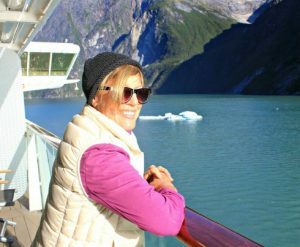 Cruising is the perfect way to explore this elusive destination and is a great jumping off point for cruisetour land options such as a visit to Denali or a trip to fish in the icy waters. Aimee and I would both love to be of assistance in booking your Alaska experience. Contact us at go@bayworldtravel.com.